With races coming thick and fast this season, punters know they have unlimited chances to place winning bets. At different venues across the US, some of the nation’s top horses compete for honours. Just because you cannot be physically present at the horseracing venues, doesn't mean you cannot partake in the thrill of picking the winning horses. 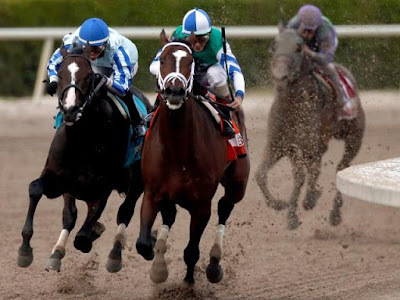 Below we share the daily picks of US races based on stats and current form so that you can place your bets confidently without having to watch how the horses perform at a land-based venue. At the Louisiana Downs, there will be seven races throughout the day. The first race features a couple of horses that dropped in grade that are also tipped as the favourites. One of these horses is Chick Lips who finished in a respectable eighth position. Going into this race, Chick Lips is the preferred choice, but he faces stiff competition from RootnandToon. The second race is a bit of a rivalry between Fast Dashing Candy and Karoles Patriot. The winner of the race is expected to be between these two, but Fast Dashing Candy has a bit of an advantage as he won his last race at Evangeline in November. With a string of near misses during the whole of 2017, Pool Party Girl will want to start 2018 on a high by winning this race. It will be a tough task however as she has to finish in front of Reachingforthemoon. Reachningforthemoon herself had an indifferent 2017, but has the added advantage of experience. The other highlight event is race 5 with two favourites, FH Tochin and Hez Our Valentine. FH Tochin won her maiden over the C&D, though Hez Our Valentine drops into the race from an upper-grade race where he managed to compete. The first race at Mahoning Valley features a horse that was widely expected to dominate the headlines at the start of 2017, El Gordo Navas. However he failed to do so as a result of a number of injuries that limited his experiences. El Gordo Navas will face competition from Battle Crossing and Three Pillars for pole position. In race 4, Don’tbothermenow who struggled at this venue a few weeks back will be seeking a change in fortunes. Odds are in favour of Dontbothermenow more so as his main competitor, Magic Apple, who lost dismally. In race 6 is an emerging horse causing waves in US racing known as Cindor Bolt. Cindor Bolt’s previous race is a testament to his ability and performance where he went on to win without any effort. Cindor Bolt’s is the clear favourite to win, while Game of Dreams and Enta the Circle are predicted to be close contenders. The first race at Turf Paradise features two horses that dropped a grade, and they are both favourites to finish in the ‘Place’ positions. This will be the third race in a row for Miss N Wildcat in this race group and as such is expected to be more accustomed to the surroundings and the turf. Another fellow dropper is West Princess who will race for the first time in the race group. Miss N Wildcat is probably the best nap of this race based on experience on the turf, but a surprise from a fellow dropper, West Princess cannot be ruled out. Race 5 is another highlight race to look out for with two favourites having contrasting fortunes. Son of a Royal is simply unbeatable while Trevor’s Call, on the other hand, is not exactly a world-beater but has shown consistency over the past year finishing among the top three places in all of his races. Based on consistency, Trevor’s Call may just be the top pick for this race.